We’d love your help. Let us know what’s wrong with this preview of Girl Overboard by Justina Chen. Everybody thinks Syrah is the golden girl. After all, her father is Ethan Cheng, billionaire, and she has everything any kid could possibly desire: a waterfront mansion, jet plane, and custom-designed snowboards. But most of what glitters in her life is fool's gold. Her half-siblings hate her, her best friend's girlfriend is ruining their friendship, and her own so-called Everybody thinks Syrah is the golden girl. After all, her father is Ethan Cheng, billionaire, and she has everything any kid could possibly desire: a waterfront mansion, jet plane, and custom-designed snowboards. But most of what glitters in her life is fool's gold. Her half-siblings hate her, her best friend's girlfriend is ruining their friendship, and her own so-called boyfriend is only after her for her father's name. When her broken heart results in a snowboarding accident that exiles her from the mountains-the one place where she feels free and accepted for who she is, not what she has-can Syrah rehab both her busted-up knee, "and" her broken heart? To ask other readers questions about Girl Overboard, please sign up. Did any of you guys like this book? Syrah was injured in a snowboarding accident. Her dream is to become a Pro-Snowboarder. Her family is unsupportive. Her father, Ethan Cheung, made the cell phone of today. Her mother, Betty Cheung, is both a fashionista and do charity fundraising. All she want to do is be on the slopes with her best friend, Age,but he is too busy with his new boyfriend. She soon befriends Lillan, an energetic and kid person. That spends most of her time at Seattle Children's Hospital. Lillan's sister, Amanda, has Syrah was injured in a snowboarding accident. Her dream is to become a Pro-Snowboarder. Her family is unsupportive. Her father, Ethan Cheung, made the cell phone of today. Her mother, Betty Cheung, is both a fashionista and do charity fundraising. All she want to do is be on the slopes with her best friend, Age,but he is too busy with his new boyfriend. This book is just plain amazing. It hit my heart strings. For those that don't know this, I am a patient at Seattle Children's Hospital. I have a immunological problem,where I am always at the doctors. I have seen some of these kids that are too young to not be playing with their friends or at school. It literally breaks my heart. I also like the plot and the fact that this book tackles such deep issues. I recommend reading this as soon as possible. I started this book at 11:15 last night. I went to bed at 5:45 this morning. I don't think I've ever done that before. It was a great read. Coming of age, but dark. Very good. Girl Overboard stars a very unhappy girl, Syrah, who is frustrated with practically everything in her life: she's unhappy with how her knee is healing after a bad snowboarding accident; unhappy that there seems to be a mental/emotional block preventing her from moving on in her life after a disappointing first taste of love/lust; unhappy that her very best friend, Adrian "Age", has a girlfriend who won't allow him to see her; unhappy that her parents ignore her except for when they're bossing her around--how her mom is always onto her about her weight, how they both rarely take her seriously and how both want to keep her from ever snowboarding again; angry with her two half-siblings, Wayne and Grace, both much older than herself; disappointed that her only real friend in the house--her nanny if you will--Bao-mu is going to be leaving the family to go care for her own granddaughter; and super-super angry that her parents have told her that they're all moving to Hong Kong next year. Syrah has an oh-so-terrible life because her parents are oh-so-wealthy. But it has its advantages in a way too--when Syrah decides she wants to be a part of her family and use everything to get what she wants. And what Syrah ends up wanting more than anything is to help someone else--to save a life. It's a coming of age novel heavy on the whine in the opening chapters. The first fifty pages didn't hook me. But I kept going, I kept reading and sure enough by the end I was enjoying it. While all the characters seemed a bit flat and stereotypical in the beginning, by the end, they were beginning (at least if not more) to become fully fleshed characters with heart and soul. Her developing relationship with her family--her mother, Betty; her half-sister, Grace; her mother's family whom she meets for the first time--her aunts and cousins, etc--add depth to this story. I liked how Syrah changed through the course of the book, how she came to be someone I could like, someone I could respect. I bought Girl Overboard because I really enjoyed Headley’s latest book, North of Beautiful. The whole snowboarding premise seemed really interesting to me because I tried snowboarding once and I fell about a million times. I’m much better at skiing. I was a little disappointed, however. For about the first 100 pages or so, I felt like I’d been thrown headlong into Syrah’s life without any explanation, even though there definitely was. I didn’t really feel a strong connection to her love interest, I bought Girl Overboard because I really enjoyed Headley’s latest book, North of Beautiful. The whole snowboarding premise seemed really interesting to me because I tried snowboarding once and I fell about a million times. I’m much better at skiing. I was a little disappointed, however. For about the first 100 pages or so, I felt like I’d been thrown headlong into Syrah’s life without any explanation, even though there definitely was. I didn’t really feel a strong connection to her love interest, Age, because he was in about three scenes and most of them involved him telling Syrah that he couldn’t see her because he had a girlfriend now. The snowboarding thing also wasn’t as big of a plot point as I thought it would be; Syrah goes snowboarding twice in the entire book. I was expecting scenes and scenes of her flying down the mountain or something. There was also the fact that not that much really happened until about page 250 or so, so I was a little bored. The writing is pretty beautiful, but that can only buoy me for so long. When things did start happening, I almost didn’t care anymore because I’d been waiting for them to happen for so long. One thing I did like, however, was Syrah’s nanny, Bao-Mu. She was the best character in the whole novel, I felt. In the beginning, I thought that she was going to be annoying, because Syrah did often feel a little annoyed with her, but as the story progressed, she wormed her way into my heart. Same with her mother’s family; they were so sweet and family-like that I kind of wished I had something like that. Mentions of all the Chinese food made me want to try some of this stuff, or at least make dumplings like they did (maybe I’ll ask my boss to make me some tonight!). Syrah Chen is the daughter of Ethan and Betty Chen and the family is very wealthy. Syrah really enjoys snowboarding but after a run in the back country, Syrah damaged her knee and had to have pins put in. Syrah’s friend is Age who is dating Natalia even though Syrah would like him for herself. Syrah dreams of getting sponsors and becoming a snowboarding star. Syrah finds a friend in Lillian who she travels with to the hospital and helps her with a party she is having for the children. Lillian ha Syrah Chen is the daughter of Ethan and Betty Chen and the family is very wealthy. Syrah really enjoys snowboarding but after a run in the back country, Syrah damaged her knee and had to have pins put in. Syrah’s friend is Age who is dating Natalia even though Syrah would like him for herself. Syrah dreams of getting sponsors and becoming a snowboarding star. Syrah finds a friend in Lillian who she travels with to the hospital and helps her with a party she is having for the children. Lillian has a sister Amanda who has leukemia. Syrah comes up with the idea for having a snowboarding benefit to raise money for the children in the hospital. She finds an ally in her half sister Grace whom she thought hated her but Grace turns out to be OK. She also confronts Jared, the boy who broke her heart and she realizes she doesn’t need him anymore. The book takes a long time to start. I had a lot of trouble getting into it and it wasn’t until after page 100 that the book started to pick up. It is hard to feel sorry for Syrah because she is so wealthy but she is a strong female character. The relationship with Age doesn’t seem to go anywhere, he disappears for the entire middle of the book and comes back right at the end and it sort of falls flat. The book is a little long and maybe it could have done without the part about the Cultural Revolution and the Leung family (Syrah’s mothers family) although interesting it adds another layer to an already convoluted story. I was afraid this was gonna be a poor-little-rich-girl story, and I don't know enough about snowboarding to care about it, but Syrah turned out to be a character easy to sympathize with. I didn't need to know about snowboarding to believe that Syrah loved it. I love character driven stories, and Syrah changes a lot, forming friendships and finding family far and close. In particular, Grace and Syrah seem so odd (Grace is old enough to be her mother!) yet so perfect as sisters. Truly wonderful re I was afraid this was gonna be a poor-little-rich-girl story, and I don't know enough about snowboarding to care about it, but Syrah turned out to be a character easy to sympathize with. After reading Justina Chen Headley’s debut novel, Nothing But the Truth (and a few white lies), I was anxiously waiting for Girl Overboard, expecting great things from a Chinese American writer. I shouldn’t have. Five chapters into the book and I already felt the enthusiasm slipping away, replaced by a blank expression as I wondered why I’d been so eager to check this out at the library. It’s the story of a billionaire’s daughter who, despite what everyone else thinks, isn’t exactly leading the After reading Justina Chen Headley’s debut novel, Nothing But the Truth (and a few white lies), I was anxiously waiting for Girl Overboard, expecting great things from a Chinese American writer. I shouldn’t have. Five chapters into the book and I already felt the enthusiasm slipping away, replaced by a blank expression as I wondered why I’d been so eager to check this out at the library. It’s the story of a billionaire’s daughter who, despite what everyone else thinks, isn’t exactly leading the most blessed life. She has her own set of problems, whether it is with her family or her friends. It’s a story of finding yourself, what you want, and what you can accomplish, with or without the money. To start off on a more positive note, it’s always interesting to read about brand new characters. Syrah, named after a brand of wine, has elements that don’t jump off in the Young Adult shelves nowadays, particularly her love for both manga and snowboarding. This athletic interest gives Syrah a more American edge to it, while the other hobby gives the reader a glimpse into Chinese-related topics. Most authors like to play with the same characters—whether they’d be the damsel in distress, a witty girl heroine, or a cynical bad boy reformed—and create stories that don’t spark any originality. But Ms. Headley has once again put life into a girl that possesses some unique qualities that will also be relatable to most teenagers. Aside from delightful supporting characters in addition to Syrah, there are lessons to be learned. It is the typical uncomfortable and pressuring family members that bring out the issues about relationships and just how high expectations can be. Considering all these things, it brings out a sense of realness to the story. As overused as the “rich girl” idea is, the author simply tells us that no one can lead a golden life, but much more in a way that doesn’t result in considerate groaning on my part. However well the book might have been in the start, the same expectation does not flow towards the middle of the book. Whether it is books or television, I’ve come across enough of dramatic storylines to voice my opinion about the dragginess and overall unnecessary points of information included. In TV, some shows can be finished without needing the extra two or more episodes, and that’s the case with this book. I remember liking how, in the beginning, each chapter ends in a meaningful way that makes you ponder, but midway, I start to notice all these side stories that unbalance the first portion. Not only does Syrah have to juggle her family, her crush, her newest friend and her sister, but she finds out her mother was adopted and Syrah has a whole other family she doesn’t know about. Just trying to summarize all these different characters makes my head ache. Is it really necessary to incorporate so many characters, stories and messages in one novel? I’ve learned that for every book an author writes, there is a purpose. But when I look at this book, I just see a battle of messy ideas that tries too hard to overlap each other. It’s like watching a group of children rush for the vacant swing, pushing another out of the way. And through that fuzzy mess, you just can’t be sure who the lucky winner is. I can’t be sure what message I’m walking away with. Although Girl Overboard doesn’t reflect Ms. Headley’s best work, it has some good passages that pull me in otherwise. While I will not recommend this, simply because of the soap opera-like dramatics and the many loose endings that really need to be tied together, I will suggest readers to read her debut novel. However, if you like little irrelevant stories, hundreds of side messages, and a non-existent relationship between one of the most important figures in her life (her best friend Age), you know the way to the nearest bookstore. If you are looking for a book that is about a Rich girl and her perfect life don't read this book. If you want to read about a rich girl who has everything perfect her and she wants that to change then you should read this book. This book is about a girl who struggles to keep being rich out of living a normal life. She wants to be able to do things regular people do. She is tried of being different and doesn't want to be the Rich bratty girl, but the girl who is just like me. I can make a text t If you are looking for a book that is about a Rich girl and her perfect life don't read this book. If you want to read about a rich girl who has everything perfect her and she wants that to change then you should read this book. This book is about a girl who struggles to keep being rich out of living a normal life. She wants to be able to do things regular people do. She is tried of being different and doesn't want to be the Rich bratty girl, but the girl who is just like me. I can make a text to self connection with this book because in my school I am different because I practice my religion more than anyone else. Since I am very strong in my religion I am looked at differently and I don't fit in as well. I just want to be like everyone else but somethings cant change. You cant change and give up on what you have so somethings will remain the same forever. Do you want to read a book about a teenage girl who has everything? Well, I know a good book that you would really love, its called Girl Overboard by Justina Chen Headley. Girl Overboard is full of surprises. Syrah the main character loves snowboarding. One day she gets into a very horrifying accident while hitting the slopes and that event changes many things in her life. With her father being a billionaire it also changes the way people think of her. Syrah's parents are not very supportive o Do you want to read a book about a teenage girl who has everything? Well, I know a good book that you would really love, its called Girl Overboard by Justina Chen Headley. Girl Overboard is full of surprises. Syrah the main character loves snowboarding. One day she gets into a very horrifying accident while hitting the slopes and that event changes many things in her life. With her father being a billionaire it also changes the way people think of her. Syrah's parents are not very supportive of her. Even her favorite sport is also leading her into emotional ruin. Her boyfriend, a fop who only tries hard to impress Syrah's parents instead of her and breaks her heart. Overall, Syrah has mostly everything a teenager could ever wish for except that her family doesn't care or even support her. But in the end something happen that changes everything the way Syrah really wanted it to be in the first place. Girl Overboard is one of the best coming of age books I have ever read. It made my heart melt! The writing style was very graceful and fluid. The book tackled self discovery, healing, friendships, familial relationships, the meaning of life, love - and did it successfully. This is my favorite aspect of Chen's works. Every book has so many facets that I learn something new wit Girl Overboard is one of the best coming of age books I have ever read. It made my heart melt! "The most gorgeous snowflakes, the ones with all the intricate shapes and patterns, drop the farthest from the sky. They don't just survive their 40,000-foot descent. They revel in their fall, that harrowing, sweeping adventure that shapes them. Literally. I had high hopes that this book would have a strong empowering messages for girls, but unfortunately it fell short of that goal. Although the author strives to leave the reader with positive messages at the end of the book, these cliches are overshadowed by the shallowness of the rest of the story. This review has been hidden because it contains spoilers. To view it, click here. The story is about a girl, Syrah Cheng, that is struggling to figure out the problems of her and her family's life. The main characters are Syrah, Age, Lillian, Betty, Ethan, Grace, and Bao-Mu. Syrah is at a point in her life where after her accident she isn't sure whether she trusts herself enough to continue to pursue her dreams of professional snowboarding. Age is Syrah's best friend who is easily influenced by his girlfriend to stop hanging out with Syrah which also helps bring out unspoken The story is about a girl, Syrah Cheng, that is struggling to figure out the problems of her and her family's life. The main characters are Syrah, Age, Lillian, Betty, Ethan, Grace, and Bao-Mu. Syrah is at a point in her life where after her accident she isn't sure whether she trusts herself enough to continue to pursue her dreams of professional snowboarding. Age is Syrah's best friend who is easily influenced by his girlfriend to stop hanging out with Syrah which also helps bring out unspoken emotions between the two best friends. Lillian is a girl just trying to make sure her sister beats her leukemia, even if that means playing along with the meanest girls in school because of their parents connections. Betty, Syrah’s mom, is hiding a secret about her past that she doesn't want Syrah to find out about. Ethan, her father, just wants her to focus on something more stable than snowboarding. Bao-Mu, her elderly nanny, just wants her to follow her heart desires, while she is still holding secrets about Syrah’s family's history. The main characters all are forced under certain circumstances to eventually help Syrah figure out her problems. The main characters all are forced to face their problems and to fix them. One example would be Betty is faced with the past she wanted to forget. The main characters also do go on adventures. An example would be when Syrah takes a trip to Canada to try to reconnect to her mother’s past. My favorite character is Lillian. She is very strong and would do anything to save her family. Personally I could relate to Syrah because she solves all her problems by facing them head on. I have felt like nothing can go right for my family like Lillian. Although I have also felt like Betty by trying to hide secrets. I really enjoyed this book. My favorite part of the book is when her mother and father suprise her with her birthday gifts because she realizes that her parents do care about her. My least favorite part of the book is when she has to force herself into a small dress and it makes her feel so low about her appearance. The author, Justina Chen, did an astounding job writing Girl Overboard. Some things could have been more flushed out, but I liked it overall. It was a good uplifting read (in its message), and I enjoyed it. It makes me want to work harder on attaining my own dreams. I thought there would be a lot more snowboarding in this book then there was; it's mainly in the beginning chapters and the last ones. It's a nice read however, especially if your hillside. I found some parts boring. I picked this book up at the school's library. It's rare to find a book about a female involved in sports. I had a hard time getting into it. It begins so whiny and angsty. But then I began to get a feel for the character and realized how lonely she is. Poor little rich girl is definitely the characterization here until she decides otherwise. I'm going to recommend this book to my Meg Cabot fans. If there’s one problem I have with this book overall, it’s the cover description. Partially for giving out the entire backstory, but mostly for making it out to seem like another cookie-cutter YA rom-com. Talk about wild misrepresentation. What looks like a fluffy, winter-vacation romance about girl snowboarders is actually a fairly deep and thought-provoking study of a girl learning to stand on her own and embracing her family, warts and all. What I love about Syrah is that she feels so real. I If there’s one problem I have with this book overall, it’s the cover description. Partially for giving out the entire backstory, but mostly for making it out to seem like another cookie-cutter YA rom-com. Talk about wild misrepresentation. What looks like a fluffy, winter-vacation romance about girl snowboarders is actually a fairly deep and thought-provoking study of a girl learning to stand on her own and embracing her family, warts and all. What I love about Syrah is that she feels so real. I love that she has so many distinct personalities—dutiful, but wants to lash out with her parents; ‘don’t bother me’ at school; even confident and cocky whenever she’s on the slopes, and she still has these moments of fear and vulnerability. I liked that she’s so complicated and hard to pin down. I really do like it in realistic YA (okay, in a lot of YA) where the conflict/plot is all centered around the romance. Syrah does linger on her ex Jared, as well as her convoluted feelings toward her best friend Age, but she doesn’t spend the whole book whining about either one. Any romantic discussion is more focused on Syrah trying to be herself, and whether or not if she necessarily needs someone to fulfill herself. Also, I just like her friendship between herself and Age—I like that they have an actual friendship, rather than just coy flirting and Syrah’s inner dialogue talking about how hot Age is. There’s some contrived drama with Age and their relationship, but I’ll touch on that in a bit. I love that a lot of the book follows Syrah’s family and her place in it. One of the things that really stands out is that Syrah is the result of a broken home and she’s had to deal with this fact for her whole life. I like that while she doesn’t exactly kiss up to her half-siblings all of the time, Syrah does try to mend fences with them. I especially love Syrah and Grace’s emerging sisterly feelings and that they’ll try to be there for each other. There’s also a nice semi-parallel with Syrah’s mother and her sisters; it’s definitely a book that deals with the healing processes. And I also liked that Syrah wanted to be more than just how her parents were, and finds a way to reconcile with her family name with her own wants and desires. One of the other things I really liked here was Lillian and her and Syrah’s growing friendship. I loved Lillian; I liked how she cared about her family, how she’s able to stand up for herself, and how she and Syrah slowly begin to open to one another. Not to mention, she’s the first to really spark Syrah’s change. I also like that because of Lillian, Syrah does start to see beyond other people’s facades, including the bitchy mean girls. The only bit I would I have liked to have seen with this (and this is my only other major problem with the book) is that I would have liked some reconciliation between Syrah and Age’s girlfriend Natalia. It just seems weird that she would have this revelation and not try to mend that particular bridge. Also, I kinda sorta maybe wanted to see more with Syrah and Bao-mu. A part of me doesn’t want to, as so much of the story is focused on Syrah growing up and moving on, but Bao-mu does contribute a lot to the story, so I wanted to see the deeper part of their relationship. As I said, despite the flirty cover, this is a surprisingly deep and interesting book. It touches on a lot of different issues—family, culture, history, self-esteem—but neither feels like it’s too cloying or simplistic. It’s a fantastic read, and I highly recommend it. If nothing else, the Chengs know how to save face. So to everyone else, Syrah Cheng's life looks like a dream come true. Her father is a billionaire, her mother is beautiful and always buying her fancy clothes (and custom-designed snowboarding gear). Between that and the mansion and private jet, it really seems like Syrah has it all. But . . . The worst part of having it all is having to deal with it all--the good, the bad, and the just plain weird. Syrah knows better than most that appearances c If nothing else, the Chengs know how to save face. So to everyone else, Syrah Cheng's life looks like a dream come true. Her father is a billionaire, her mother is beautiful and always buying her fancy clothes (and custom-designed snowboarding gear). Between that and the mansion and private jet, it really seems like Syrah has it all. But . . .
Syrah knows better than most that appearances can be deceiving. She almost never sees her parents, her half-siblings hate her, and it turns out real friends are not that easy to find when you can buy everything else. What Syrah doesn't know is how to change any of that, especially when she's been deceiving herself for so long. Girl Overboard (2007) is Justina Chen Headley's second novel (following Nothing But the Truth (and a Few White Lies) from 2006). The writing here is snappy and really moves the text along, so much so that the story very quickly demanded my full attention to better catch the nuances of Syrah's narration. The writing here is also grittier than a lot of books I have read lately. Syrah's loneliness and depression are so tangible in the early stages of the book that, at times, reading it was painful. After years of being a loner with a one-track mind for snowboarding, Syrah's snowboarding accident and resulting knee injury force her to look at her entire life in a new light. If one bad accident can leave Syrah terrified of her chilly home away from home, what else has Syrah misinterpreted? It turns out the answer is a lot. This book deals with many themes in addition to snowboarding and overcoming a really scary injury (partly inspired by the author's own bogus wipeout). A first-generation American herself, Syrah's family still bears the scars of their past in China during the Cultural Revolution.The story also provides an interesting commentary on the cost of keeping up appearances and friendship. At its core though, Girl Overboard is about a girl who has found herself adrift and, while trying to get her own bearings, realizes she can help those around her at the same time. In this novel Headley spends a lot of time in Syrah's head, partly because the book is narrated in the first person, but also because Syrah is a solitary creature--especially after her Accident. For this reason, Headley is really able to trace Syrah's growth as a character. At the beginning of the novel Syrah is lonely, sad, and desperate for a way out of her life. But as the story progresses, Syrah learns that before you can ask for help you have to think you deserve it. In fact, you have to think you deserve it all because if you don't who will? I love those quotation marks at the end of the synopsis. Totally LOL moment. Okay. Girl Overboard sounds like a book rich heiress should read. But really, it's a book most people should read. Or maybe not, because it's a four hundred page book that is sort of boring. Okay, I'll admit it. It's boring in the middle part of the book. There's a lot of good stuff in the book (I mean good lessons), but it can be overwhelming to the point of them just giving you an old man's advice on his death bed. Of c I love those quotation marks at the end of the synopsis. Totally LOL moment. Of course, there wasn't any character that died in the book. I hate how slow the book went. It was already enough for a book to be four hundred pages, but to have the story go slow? That's too much. It's like "Someone please kill me now" or "I'm going to cheat on this book by reading something else." On to other subjects of the book. Most of us probably don't know about snowboarding. I know I don't, partially because I live in the area where no one knows how to snowboard. Maybe some of us know, but the majority definitely don't know. And that's another reason to not read this book: Weird words/terminology used by people who snowboard. (Let me think about what I just said). Also people who know some things about snowboarding. It would had been helpful if the author conveniently placed a glossary in the front of the book. (I don't look at the back unless I want to read the acknowledgements). Bringing in references to people. I wish the author written in some real people, because there's a lot of fake people and that annoys me like crazy. It would be awesome if NPH or Ryan Gosling somehow appeared into the story. Or the snowboarding experts like Shawn...Shawn...er...I don't remember his last name. I think it's White, but I'm too lazy to check. Beside, interent connections is down. The Chinese words blending in with the English. I can easily understand pingyin (basically the cheat-cheat on pronunciation for lazy Americans). Sometimes it gets irritating because there's a bunch of Chinese words which can be mistakenly taken for one another. (Pingyin gets confusing when it's without the accent marks. Xi and Xi may be referring to a whole bunch of words, like four or death). The lesson learned at the end of Girl Overboard is adorable, but I don't think it's necessary to mention it, telling the readers (a summary of) what they learned from the story. Heck, I should had skipped to the end and read that part instead of reading the entire story. Would had saved a lot of time. Syrah is definitely a smart golden girl. She's caring and cautious. She's a unique girl, with a heart of gold. I love how she changes throughout the story, but she has something I'll call dry humor. Humor that exist, but isn't funny. 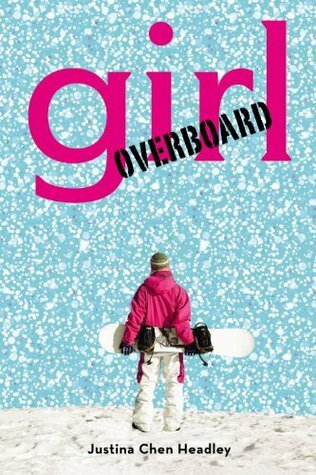 Girl Overboard by Justina Chen is yet another book about a rich spoiled brat, only the names ever change and in this book its Syrah, her father Ethan Cheng, is of course a billionaire and she has everything any kid could possibly want; a waterfront mansion, jet plane, and custom-designed snowboard, and what kid would want that i have no clue. Her best friend's girlfriend is trying to break up their friendship, and she also has a border line crush on him. She organizes a snowboarding fundraiser t Girl Overboard by Justina Chen is yet another book about a rich spoiled brat, only the names ever change and in this book its Syrah, her father Ethan Cheng, is of course a billionaire and she has everything any kid could possibly want; a waterfront mansion, jet plane, and custom-designed snowboard, and what kid would want that i have no clue. Her best friend's girlfriend is trying to break up their friendship, and she also has a border line crush on him. She organizes a snowboarding fundraiser to raise awareness for bone marrow transplants, but at the fundraiser she sees her old “boyfriend,” the one that used her to get to her father, she tells him off like she should have done before now. This book is similar to The Daughter series by Joanna Philbin, again it’s about the daughters of rich parents, the parents try to force the daughters to go into the same business as them and the daughters don’t want to so they rebel, they then finally stand up for what they want. I didn’t like this book because she’s just another rich kid only caring about herself, but then she realizes that she can do good with her father’s money so then she raises awareness for a cause that affects her and her new friend. I want to find a good, well written, realistic book that is easier to relate to than the crap I am reading now. I don’t think I will read another book by this author, but I might read another book of this genre. hopefully in the other book I read in this genre I will find ones without plot like this one that has been done and redone a thousand times. They over do this kind of stories so it’s hard to find books of a different plot. I rated this book one star because I just did not like it. It annoyed me with its plot, and writing, I would not read this book because it’s just another about some rich girl getting everything she wants, and having “hard times” that of her getting her knee busted up. This book just made me angry because she was complaining about not being able to “do” anything, the children of those rich mostly stuck up and unaware of anyone else's problems. If you are looking for a rags-to-riches story, don't pick up GIRL OVERBOARD. On the other hand, if you are looking for a story about a rich girl struggling to be a normal, well-adjusted girl, than this one is for you. Syrah Cheng is the daughter of privilege. Her father, Ethan Cheng, made the cell phone what it is today. Her mother, Betty Cheng, is the queen of charity fundraising, and demands only the best. Unfortunately, all the splendor and wealth surrounding Syrah leave her feeling uncomfortable and unloved. Syrah's dream is to become a sponsored pro-snowboarder; however, a recent life-threatening accident has sidelined her with a bum knee. Her doctor says she is ready to resume normal activities and even some cautious snowboarding, but her globe-trotting parents have forbidden her participation in the only activity that makes her life worthwhile. She fills her days with school and manga drawings of a superheroine snowboarder named Shiraz. Not being able to snowboard is only the beginning of trouble for Syrah. Her best friend, Age, has a new girlfriend who doesn't believe there is room in their relationship for Syrah. Bao-mu, Syrah's dedicated nanny, has announced that she is leaving to go help her granddaughter with her new baby. And to top it all off, Ethan Cheng has announced his retirement and his intention to move the family to Hong Kong. It was very refreshing to read a book about a rich girl who isn’t snobby and focused on fashion. I’ve read those book, and they’re not at all different. I expected some rich teenage rebel story, but that’s not what I got. Syrah is really a nice character, and doesn’t feel the need to conform. She also doesn’t need to go all out, abandoning her parents, family, and values. I really admire Headley for keeping it real. Still, it wasn’t one of my favorite books. The beginning was great- grabbed me right into the book. The middle, like so many books, slowed down, and I lost what I loved about Syrah so much. She didn’t seem to have the same spirit, and she just floated by what her parent’s told her. The end of the middle got much better, Syrah came back. My favorite part of the book was definitely the end. I don’t want to spoil it, but I do want people to keep reading. I lost hope in the middle, but the ending is perfect. It surprised me, and I love the twist at the end. Interesting premise - We all read that rich girls have it all. Designer clothes, shoes, bags, dresses etc... Well, this is about a rich girl who seems to have it all, but in reality she's broken (physically, and mentally) just as everyone else. I enjoyed reading about Syrah's life, and how she tackled her fears. Breaks The Gender Barrier - I know many people who think snowboarding is a "boys" sports. To be honest, I also thought that snowboarding was more of a guys sport. This book broke that gender barrier in a subtle, but effective way. This also shown some light on the expectations placed on girls. Syrah is considered fat in her family, which ruins her family images. However, in the end Syrah changed her views on her weight. She realized that how she looks doesn't really matter, and there are other important things (Like tying to save your BFF's sister from dying form cancer) than her appearance. Great Character Development - Like stated above, Syrah changed her ways, and her opinion on what matters the most (like peoples's opinion of her looks). It was fun too see her progress, and yell at her for doing the stupidest things. Whiny Narrator - Syrah was great, and all, but what's with all the whining?? She literally cried about (not so) pathetic life half the book. She cleared up during the later half of the book, but it was still aggravating.